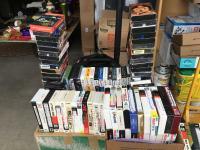 Several old movies taped on VHS tape that can be taped over. 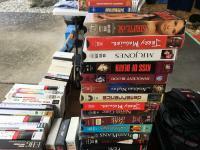 Also have 50 movies and instructional VHS tapes for sale. 112 VHS tapes in all! Entire lot for $99.99! Striptease, Jerry McGuire, The 9th Gate, The 5th Element, The Birdcage, Parenthood, Joan of Arc, Beowulf, The Insider, Afterglow, Purple Moon, Mr. Jones, Deterrence, Shallow Grave, Willd Wild West, Primary Colors, A Mighty Wind, Fear, Best Laid Plans, The Love Letter, SO YOU WANT TO BE A GAMBLER, etc.